The Hokuriku Shinkansen (北陸新幹線) is a high-speed shinkansen railway line jointly operated by East Japan Railway Company (JR East) and West Japan Railway Company (JR West), connecting Tokyo with Kanazawa in the Hokuriku region of Japan. The first section, between Takasaki and Nagano in Nagano Prefecture, opened on 1 October 1997, originally called the Nagano Shinkansen (長野新幹線) (Takasaki is linked to Tokyo by the Joetsu Shinkansen). The extension to Toyama in Toyama Prefecture and Kanazawa in Ishikawa Prefecture opened on 14 March 2015. Construction of a further section onward to Fukui and Tsuruga in Fukui Prefecture commenced in 2012, with scheduled opening in fiscal 2022. The route of the final section to Shin-Osaka was decided on 20 December 2016 as the Obama - Kyoto route, with construction expected to begin in 2030 and take 15 years. Since March 2015, services on the line are split into four types, with train names as listed below. Trains operate over the Joetsu and Tohoku Shinkansen tracks between Tokyo and Takasaki. The original Nagano Shinkansen Asama services, introduced in 1997, replaced the conventional Shin'etsu Main Line limited express services, also named Asama, which previously took 2 hours 50 minutes from Tokyo (Ueno Station) to Nagano. Following the opening of the Shinkansen, part of the conventional line was abandoned between Yokokawa and Karuizawa. This section included the steeply-graded Usui Pass which required the use of bank engines on all trains. The boundary between JR East and JR West lies immediately to the north of Jōetsumyōkō Station. Stations in italics are not currently operational. With the start of Nagano Shinkansen services, trains were operated by a new fleet of JR East E2 series 8-car sets. A fleet of 17 new E7 series 12-car trainsets were phased in from March 2014, and these were augmented by a fleet of 10 JR West W7 series 12-car sets introduced from March 2015. The remaining E2 series trainsets were withdrawn from Hokuriku Shinkansen services on 31 March 2017. The original E2 series 8-car "J" sets, primarily used on Tohoku Shinkansen services were also used on some Asama services until they were subsequently lengthened to 10 cars. One specially-modified 200 series set, numbered F80, was used on additional Asama services in February 1998 during the 1998 Winter Olympics held in Nagano. The train was modified to operate on both 25 kV AC 50 Hz and 60 Hz overhead power supplies, incorporated weight-saving measures to comply with the 16 tonne axle load restriction, and included additional control equipment to cope with the 30‰ gradient of the Nagano Shinkansen. Its maximum speed was limited to 210 km/h (130 mph). The last services operated using eight-car E2 series trainsets ran on 31 March 2017, from which date all Asama services were formed of E7 and W7 series trainsets. The initial section between Takasaki and Nagano opened on 1 October 1997, in time for the 1998 Winter Olympics in Nagano. Between May 2012 and March 2014, station platforms on the Nagano Shinkansen had their platform roofs extended to handle the E7 series 12-car trains which entered service in March 2014 ahead of the March 2015 opening of the extension beyond Nagano. The Hokuriku Shinkansen extension from Nagano to Kanazawa opened in March 2015. The 113-km extension from Kanazawa to Tsuruga was approved for construction in June 2012. From the start of the revised timetable on 15 March 2014, E7 series trainsets were introduced on Asama services. Initially used on seven return services daily, this number was increased to eleven return services daily from 19 April 2014. Construction of the extension from Nagano to Kanazawa was completed on 24 May 2014. When services commenced in March 2015, the travel time from Tokyo to Toyama was reduced to about 2 hours, with Kanazawa an additional 30 minutes away. Final permission to start construction to Fukui was granted in December 2011, with modification works to Fukui Station already in progress for several years in anticipation of the extension. 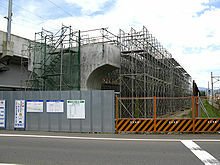 The extension to Tsuruga was approved for construction on 30 June 2012, and is scheduled to open in fiscal 2022. Beyond Jōetsumyōkō Station, the line is operated by West Japan Railway Company (JR West) instead of East Japan Railway Company (JR East). Test-running on the JR East section of the line between Nagano and Kurobe-Unazukionsen commenced on 1 December 2013, initially at low speeds using the "East i" test train. From 6 December, test-running commenced using 10-car E2 series trainsets, with running speeds gradually increased to the full line speed of 260 km/h (160 mph). Test-running continued until the end of March 2014. Test-running on the entire line between Nagano and Kanazawa (Hakusan Depot) started on 1 August 2014, using the "East i" test train. Test-running using W7 series trains commenced on 5 August 2014, initially at low speed, on the JR West section between Kanazawa and Jōetsumyōkō. The route of the final section from Tsuruga to Osaka was finalized on 20 December 2016 as the 'Obama-Kyoto route. The following four options were under consideration, with a fifth unofficial option suggested by a local politician. Maibara Route (米原ルート): This involved building a full standard shinkansen track to Maibara Station. It was one third of the length of the Obama Route, and provided good access to both Kyoto and Nagoya. It would have resulted in longer travel time to Osaka than the other options, and trains would have had to use the existing, already near-capacity Tokaido Shinkansen tracks between Maibara and Shin-Osaka. Kosei Route (湖西ルート): This involved no new track construction; instead, this proposal would have upgraded the Kosei Line to Kyoto, either by regauging or dual-gauging the line to support Mini-Shinkansen, or alternatively utilising Gauge Change Train (GCT) operations. This was the cheapest option, but meant train speeds would likely be limited to a maximum of 160 km/h (100 mph) and hence travel times would have been longer than the other options. Obama Route (小浜ルート): First proposed in 1973, this route involved building a full standard shinkansen track via Obama and Kameoka. It was the shortest route to Osaka, but also the most expensive (approximately 1 trillion yen), and would have bypassed Kyoto. Obama-Kyoto Route (小浜・京都ルート): This, the now selected route, was first made public in August 2015, and involves following the proposed Obama Route west as far as Obama and then building shinkansen track southward to link with the Tokaido Shinkansen at Kyoto. Including Kyoto on the route is seen as important to increase tourism. Maizuru Route (舞鶴ルート): Kyoto politician, Shoji Nishida's proposal from Tsuruga, via Obama, to Maizuru then south-east to Kyoto, eastern Osaka and Kansai Airport. This option was uncosted but would have been the most expensive due to the scale of the proposal. Its case was to provide development to the Maizuru region as per the Japanese national government's policy, with the Maizuru Maritime Self-Defence Force Base and several nuclear power stations put forward as reasonable traffic generators. The option to extend the line south of Kyoto to a new Osaka station (located to the south east of Osaka) and onwards to Kansai International Airport was seen as a means to avoid the congestion of the Tokaido line. It may have served as an alternative route or terminus to Shin-Osaka station for Tokaido line trains, reducing Tokaido line congestion. A government committee deliberating the proposals decided in April 2016 to narrow the proposed route to three alignments between Tsuruga and Kyoto and two alignments between Kyoto and Shin-Osaka (a northern route through Minoh and a southern route through the Kansai Science City). On 6 March 2017 the government committee announced the chosen route from Kyoto to Shin-Osaka is to be via Kyotanabe, with a station at Matsuiyamate on the Katamachi Line. There had previously been discussion of routing the line to Tennoji, a major terminal in southeast Osaka, which would allow an extension of the line to Kansai Airport. In order to extend the benefits of the Hokuriku Shinkansen to stations west of Tsuruga before the line to Osaka is completed, JR West is working in partnership with Talgo on the development of a Gauge Change Train (CGT), which will be capable of operating under both the 25 kV AC electrification used on the Shinkansen and the 1.5 kV DC system employed on conventional lines. The six-car train is due to start trials on the Hokuriku Shinkansen and the 1067 mm-gauge Hokuriku and Kosei lines in 2017. As part of the project JR West has already begun trials with a purpose-built 180 m-long gauge-changer at Tsuruga. With the opening of the initial Nagano Shinkansen section in October 1997, the section of the conventional (narrow gauge) Shinetsu Main Line running along approximately the same route between Karuizawa and Shinonoi was transferred from the control of JR East to a newly established third-sector railway operating company, Shinano Railway, becoming the Shinano Railway Line. With the opening of the Hokuriku Shinkansen extension north of Nagano on 14 March 2015, the conventional lines running along approximately the same route were transferred from the control of their respective JR owning companies to newly established third-sector railway operating companies funded primarily by the prefectural and municipal governments through which the lines pass. A total of 252.2 km (156.7 mi) of route between Nagano and Kanazawa was transferred to four separate operating companies, including 75.0 km (46.6 mi) of the Shinetsu Main Line between Nagano and Naoetsu, and 177.2 km (110.1 mi) of the Hokuriku Main Line between Naoetsu and Kanazawa. Details of the four third-sector operating companies and their respective lines are as shown below. ^ 北陸新幹線、来年３月１４日開業　東京―金沢２時間半 [Hokuriku Shinkansen to open 14 March next year: Tokyo - Kanazawa in two and a half hours]. Tokyo Shimbun Web (in Japanese). Japan: Chunichi Shimbun. 27 August 2014. Archived from the original on 27 August 2014. Retrieved 27 August 2014. ^ a b "Hokuriku extension route agreed". Railway Gazette. London. 23 December 2016. Retrieved 23 March 2018. ^ 北陸新幹線 長野～金沢間開業に伴う運行計画の概要について [Outline of service plans for opening of Hokuriku Shinkansen from Nagano to Kanazawa] (PDF) (Press release) (in Japanese). Japan: JR East & JR West. 27 August 2014. Retrieved 27 August 2014. ^ a b c 3月15日ダイヤ改正と各地の話題　[15 March timetable revision and topics from around the regions]. Tetsudō Daiya Jōhō Magazine (in Japanese). Vol. 43 no. 361. Japan: Kōtsū Shimbun. May 2014. p. 12. ^ 北陸新幹線「Ｅ２系」今月引退…五輪輸送で活躍 [Hokuriku Shinkansen E2 series to be withdrawn this month - Played an active role in transportation during the Olympics]. Yomiuri Online (in Japanese). Japan: The Yomiuri Shimbun. 21 March 2017. Archived from the original on 21 March 2017. Retrieved 22 March 2017. ^ a b 200系F80編成 [200 series set F80]. Japan Railfan Magazine. Vol. 38 no. 444. Japan: Koyusha Co., Ltd. April 1998. p. 64. ^ E2系N編成“あさま”の営業運転終了 [E2 series N set Asama services end]. Japan Railfan Magazine Online (in Japanese). Japan: Koyusha Co., Ltd. 1 April 2017. Archived from the original on 1 April 2017. Retrieved 3 April 2017. ^ a b Ito, Tadayuki (3 May 2012). 新幹線ホーム屋根延長へ　長野県内各駅、金沢延伸に備え [Nagano Prefecture shinkansen station platforms to have roofs extended in preparation for extension to Kanazawa]. The Asahi Shimbun Digital (in Japanese). Japan: The Asahi Shimbun Company. Archived from the original on 12 May 2012. Retrieved 3 May 2012. ^ a b Igata, Katsuhiro (25 May 2014). "Hokuriku Shinkansen line between Nagano, Kanazawa completed". ajw.asahi.com. Asahi Shimbun. Archived from the original on 28 May 2014. Retrieved 27 May 2014. ^ a b c d 北陸新幹線延伸「小浜・京都ルート」も検討　ＪＲ西日本 [JR West also considering Obama-Kyoto route for Hokuriku Shinkansen extension]. Asahi Shimbun Digital (in Japanese). Japan: The Asahi Shimbun Company. 29 August 2015. Retrieved 29 August 2015. ^ Kyodo News, "DPJ may OK three new bullet-train sections", The Japan Times, 17 December 2011, p. 1. ^ a b c 北陸新幹線、１２月１日から走行試験 [Hokuriku Shinkansen test running to start from 1 December]. Webun (in Japanese). Japan: The Kitanippon Shimbun. 5 October 2013. Archived from the original on 8 October 2013. Retrieved 9 October 2013. ^ E926形"East-i"が金沢（白山総合車両所）まで走行試験 [Class E926 "East i" test run to Kanazawa (Hakusan Depot)]. Tetsudo Hobidas (in Japanese). Japan: Neko Publishing. 4 August 2014. Retrieved 5 August 2014. ^ 北陸新幹線金沢～上越妙高間でW7系による走行試験が始まる [Test-running using W7 series begins on Hokuriku Shinkansen between Kanazawa and Jōetsumyōkō]. Tetsudo Hobidas (in Japanese). Japan: Neko Publishing. 5 August 2014. Retrieved 5 August 2014. ^ a b Johnston, Eric (24 January 2016). "Politics heating up over Hokuriku Shinkansen Line's undecided last leg". Retrieved 23 March 2018 – via Japan Times Online. ^ お知らせ : 京都新聞. www.kyoto-np.co.jp. Kyoto News. Retrieved 23 March 2018. ^ 北陸新幹線“京田辺市ルート”最終調整へ｜日テレNEWS24. news24.jp. Retrieved 23 March 2018. ^ "終点は新大阪駅　与党検討委、北陸新幹線延伸で一本化". The Nikkei. 26 April 2016. Retrieved 28 April 2016. ^ 北陸新幹線、「けいはんな」通る第３案　京都と大阪間、与党委. The Nikkei. 12 April 2016. Retrieved 13 April 2016. ^ a b Osano, Kagetoshi (March 2015). 北陸新幹線並行在来線各社の姿 [Guide to companies operating conventional lines alongside the Hokuriku Shinkansen]. Tetsudō Daiya Jōhō Magazine (in Japanese). Vol. 44 no. 371. Japan: Kōtsū Shimbun. pp. 28–33. Wikimedia Commons has media related to Hokuriku Shinkansen. This page was last edited on 12 January 2019, at 16:12 (UTC).